Trauma is a common cause of acute renal failure. This may arise directly from injuries to the kidneys themselves despite their protected position (Figure 1). Trauma can also cause acute renal failure by damaging the renal arteries, which may be actually avulsed from the kidneys, or stretched at the time of impact, with tearing of the arterial wall and secondary thrombosis. 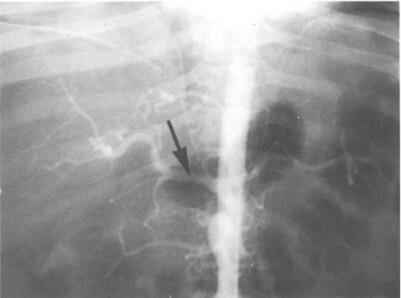 Figure 2 shows the renal arteriogram of a young man who presented with anuric acute renal failure after a motorbike accident. Only the upper pole of the right kidney is perfused since this patient had two renal arteries to each kidney, and only one remains patent. The renal veins may be similarly avulsed, also causing acute renal failure. 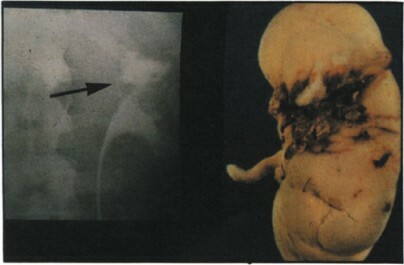 IVU showing extravasated contrast (arrowed) and nephrectomy specimen of ruptured kidney following a road accident. Arteriogram of patient with acute renal failure following road accident showing occlusion of two left renal arteries and lower of two right renal arteries and an upper right renal artery which is patent (arrowed).